Note The Website and Mobile Wireframe Templates are different from the legacy Wireframe Diagram Template which is primarily designed for desktop applications. For each template, you can either choose a starter diagram to get a quick start or a blank drawing. Each template has five stencils (containers, controls, media, text, and navigation) with many shapes in each. Containers provide you with pre-created groups of shapes representing different dialogs and cards to help quicken your wireframe diagram creation. Wireframe stencils also have smart shapes, such as a range slider or progress bar, that you can customize with control points and right-click menu actions to modify state, numeric values, or visual styles. These templates are generic and may be used for different browsers and mobile devices. 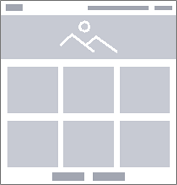 A blank template that allows creation of a website's basic content layout, including interfaces and navigation, and how they work together. A starter diagram for a website that is rich in text and media. A starter diagram for a website for a product's landing page. A starter diagram for an e-commerce website. A blank template that allows creation of a mobile app's basic content layout, including interfaces and navigation and how they work together. A starter diagram for a mobile app representing list items. A starter diagram for a mobile app that is rich in text and media. A starter diagram for a mobile app representing a user profile screen.